I have a lot of projects happening right now. 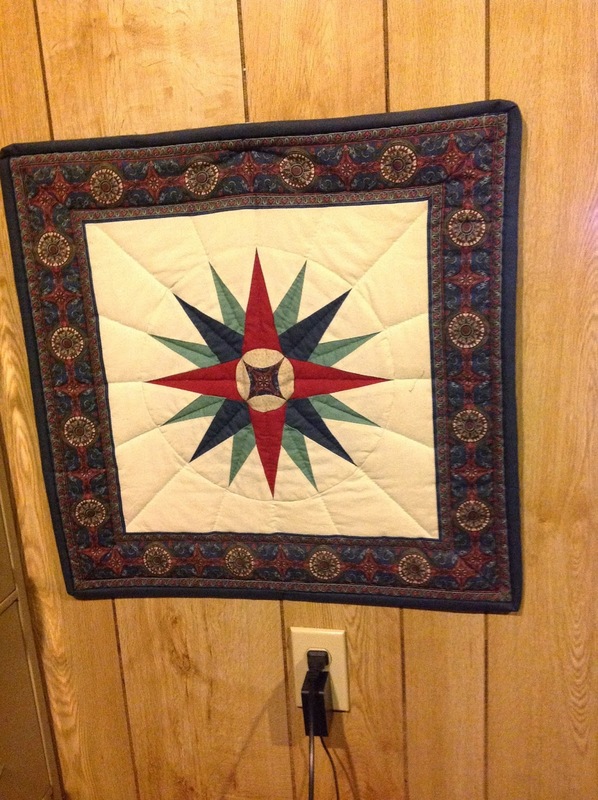 I shared with you my fan quilt and the mariner compass. I also started Bonnie K. Hunter's mystery - Grand Illusion in November. You can find more info here. I love everything that Bonnie does. If you haven't been to her site, please check it out! All of her quilts are scrappy and she has an abundance of free patterns, tips, recipes and more on her site. This is my Clue #1 finished. Most people have finished their quilts. However, not me. I am using similar colors to the suggested colors, except mine are reproduction prints instead of brights. I also plan to use some embroideries in the center of the blocks. It will be some time before I complete this since I have a priority project right now. That is kind of what happened. I have good intentions, but then other things come along that need to be done. It doesn't really matter. I sew slowly and enjoy it along the way. 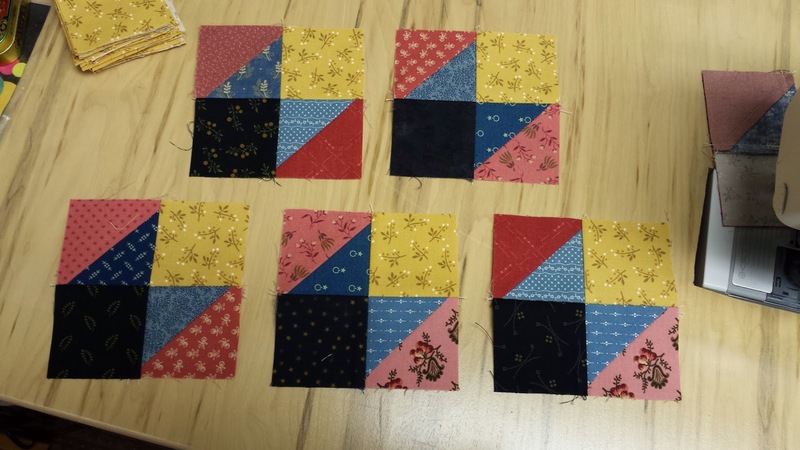 Another project I started is a Quilt A Long from American Patchwork and Quilting. You can find more info here. You will find a list of all of the bloggers that are participating, including Bonnie. The directions are featured in their April 2015 issue. 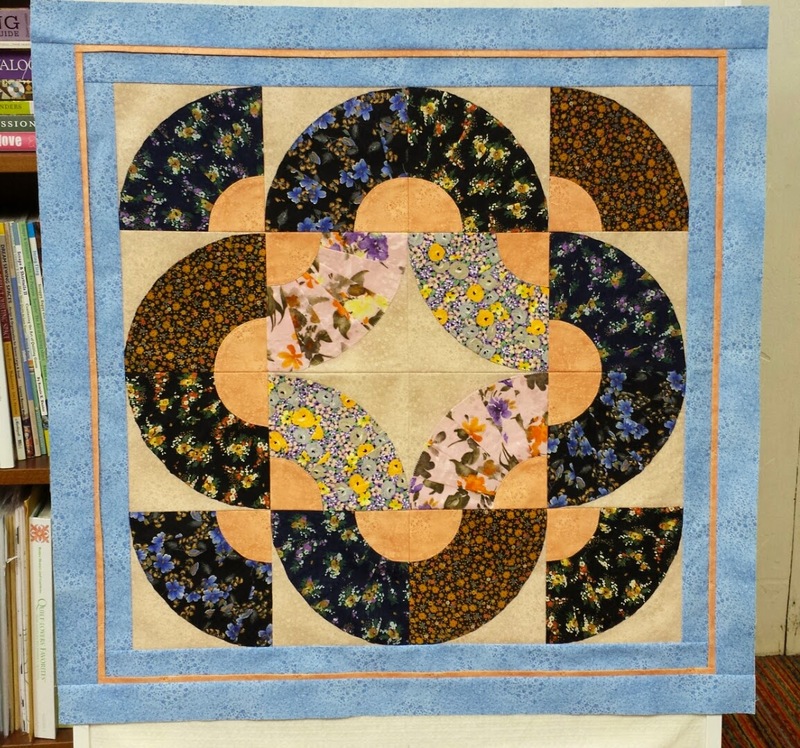 I didn't really need another project, but I loved that the quilt along only involved making four patches. How much time would it really take me to sew some of those?!!! Ok. A little time. I loved the quilts that were shown but decided that I would design my own. So I have the center of my quilt figured out, but not the borders yet. I decided that I could accomplish this by making the four patches using Bonnie's leader ender process. You can also read about that on her blog under tips and techniques. So that is what I am doing. I need 65 four patches for my design and I now have 34 finished. Love it! My priority project is kind of hush, hush. But I will share a sketch of it and can tell you that it involves 5" stars with some pretty small pieces, like 5/8" squares. I will have to wait a few months to show you this project finished. Well, I guess I had better get back to sewing! Today I had a chance to attend a class in which we were making a Mariner Compass. It has been a long time since I was able to take a class and it was wonderful! The class was taught by Betty Neff who was also the designer of this pattern. She was great! She shared many tips and ideas that not only helped with her pattern, but will definitely help with future projects. It was also great to spend the day with some friends and just have a relaxing day. The class was held at a friend's house, so warm and inviting. Thank you Pat for an awesome day! The mariner compass was made using paper foundation piecing. The top photo shows what I accomplished today along with an image from EQ7 showing how my finished block should look. 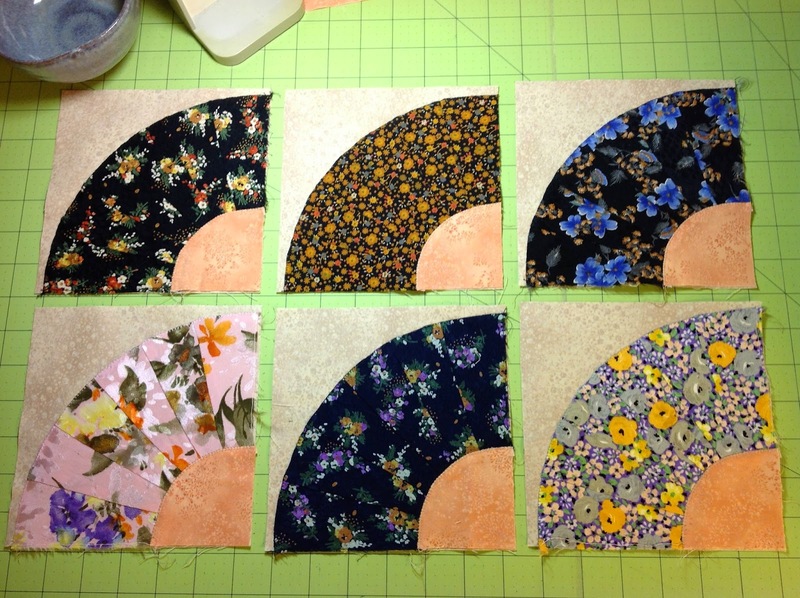 The fabric above my pieced parts is the floral for the background. The lower photo is the Mariner Compass pattern by Betty Neff from the Pennsylvania Quilter. If you would like to see more of Betty's designs, you may check them here. I wanted to use fabrics that I had in my stash and I remembered this blue and yellow combination from Marcus Brothers called Subtle Skies. I loved those and thought they would be perfect for this time of year. I am so ready for Spring, and these definitely help bring a Spring feeling inside! I originally thought that I would use a light yellow gold background including the background behind the points. Over all it would have been a very soft blended palette. My hubby thought it needed a little zing, perhaps just in back of the points. So I searched my stash for a blue that I thought would work. I was happy that I took his advice. I think it really makes my fabrics pop! I only have fat quarters of all of the prints, so I really needed to make this work. I decided to shrink the pattern to 70%. It should be about 15 1/2" finished instead of 22". That was the only way that I would have enough for the background. I'm not sure what I am doing for the border at this point, but I am sure that it will evolve as I go along. I found doing the pattern using foundation paper piecing quite enjoyable and definitely an easier way to do this particular design. Probably close to 40 years ago, I made one for my hubby. 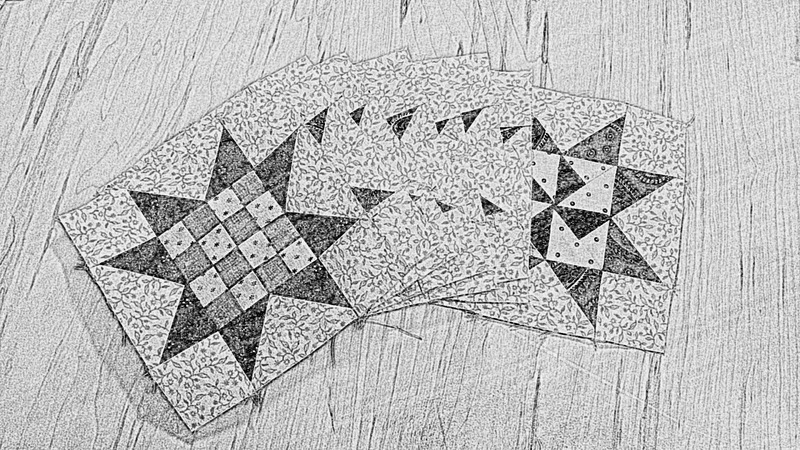 I remember using a pattern from Quilter's Newsletter and doing all of the piecing by hand. I was pretty much a beginner quilter then, but figured I would tackle it. I've come a long way baby! Another thing that I enjoyed today was sewing with my Singer Featherweight. It sews such a wonderful straight stitch and I think it helps make me feel even more relaxed and to just enjoy the process. Betty also sells featherweights and parts and can help you with any questions you may have in regards to this wonderful little machine. I was fortunate enough to get a new LED light bulb for it. What a difference. So much light! Love it! Here's wishing you some wonderful relaxing sew filled days! Quite a number of years ago, my hubby took a business trip to China. My one request was for him to bring me back some silk for a quilt. It apparently was not an easy task, but he was finally able to find a shop and brought back a number of 1/4 yard pieces. I decided that I would really like to use all of them in one quilt, even though I was not sure if they would work together. This was before my scrappy quilt days! :-) I knew that I wanted to make fan blocks from them. I needed to decide the best way to stabilize the silk in order to sew my blocks. The silks were very lightweight, not like a mid to heavyweight brocade. I debated on fusing a lightweight interfacing to them, but decided that I would paper foundation piece the fan part and that way the paper would stabilize them. I have had the fan part of the block finished for years, but did not do the curved bottom of the fan until this past year. My goal was to finally finish this project. I succeeded in finishing the quilt top this past summer, but have not gotten around to quilting it yet. Other projects have taken precedence. Hopefully I will quilt it this summer. I thought that I would share a picture of it now with you, since I am not sure when it will be totally finished. I hope you like it!